Search for the latest homes, condos, and lots for sale in northwest Florida's coastal communities of the Emerald Coast. Learn more about the distinct qualities of these coastal communities with our local Coastal Communities Guide. Are you deciding where to buy a new home or vacation home? 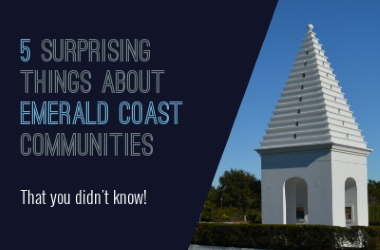 You should consider Florida’s Emerald Coast! This is the coastal area of Florida’s panhandle from Pensacola to Panama City. Over the years, it has become a favorite beach, fishing, and golfing destination. We hear all the time we have some of the world's most beautiful beaches. The sand is sugar white, and the water is often a beautiful emerald color. We enjoy a warm and temperate climate, and it rarely gets below freezing. Because the coastline faces southward, spectators can enjoy sunrises and sunsets over the water. It is also a quick trip from many of the South's big cities including Atlanta, Birmingham, Chattanooga, Jackson, Memphis, Mobile, Nashville, and New Orleans. This makes the area a great choice if you’re looking for a quick getaway or wanting to generate rental income. Coastal communities and neighborhoods along the Emerald Coast each have their unique features and advantages. For example, some areas may be better suited for to full-time residents and others to maximizing rental income. If you are relocating or buying a home, we welcome you to start your research here. Take a look at our local community guides and listed properties to get a feel for areas that appeal to you. Feel free to contact us at any point and tap into our local expertise. This is what we love to do! Let us help you to find a home that matches your personal list of wishes & needs. The listings on this page include real estate properties on the Emerald Coast of Florida. If you’re interested in scheduling a showing or learning more about any one of these homes, simply fill in your contact information and click the “Request More Info” button. Our team is here to provide you with any information you need, including disclosures, the sales history of a property and nearby market data.